A randomised controlled trial was conducted to evaluate the effectiveness of a nurse-delivered Head and Neck Cancer Survivor Self-Management Care Plan (HNCP) for patients who had completed treatment for head and neck cancer (HNC). Ten oncology nurses were trained to deliver the HNCP. The HNCP consisted of one face-to-face hour-long meeting in which the patient’s treatment was recorded, as were contact details of health professionals involved in their care and follow-up schedules. Patients were guided to nominate up to three goals for their future well-being and assisted to devise an action plan to achieve these. The HNCP was given to the patient and a copy was forwarded to their primary care physician. 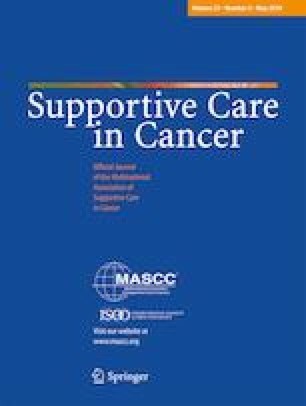 One hundred and nine patients were randomised after definitive curative intent treatment, 36 to HNCP, 36 to receive information about survivorship, and 37 to usual care. The primary outcome, analysed by intention-to-treat, was change in quality of life measured by the FACT-H&N from baseline to 6-month follow-up. Quality of life of all groups decreased at 3 months but was close to baseline at 6 months. Compared with the usual care group, the only statistically significant mean difference at 6 months was for the information group on the physical well-being domain (mean difference 0.4, 95% − 1.8, 2.6, p < 0.05). A single-session nurse-delivered intervention is insufficient to improve the quality of life in HNC survivors compared with usual care. Provision of detailed written information about HNC survivorship is associated with improved physical well-being. We thank the participating oncology nurses at Princess Alexandra Hospital and Royal Brisbane and Women’s Hospital. Dr Damien Thomson reviewed the original grant application. We thank Ms Fiona Caristo for her role as a research assistant, and Dr Sandro Porceddu and Ms Leanne Stone at PAH and Ms Helen McDade and Mr John Verbeeten at RBWH. This study was financially supported by the National Health and Medical Research Council (study ID: 1041640). All procedures performed were in accordance with the ethical standards of each institution and the respective Universities and with the 1964 Helsinki declaration and its later amendments or comparable ethical standards. The funding body had no role in the study design, collection, analysis or interpretation of data, or writing of report, or decision to submit for publication. The authors have no financial relationship with the funding source. The authors have full control of all primary data and agree to allow the journal to review data if requested.